Facets of Liberty is an anthology about human freedom. 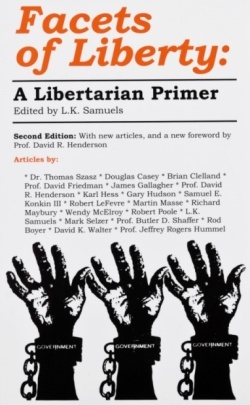 Many of the thought-provoking articles in the original edition came from the libertarian student movement in the 1960s and 1970s, before the rise of the Libertarian Party. Considered radical at the time, most were penned by well-known authors such as political adviser Karl Hess, entrepreneur Douglas Casey, law professor Butler D. Shaffer, philosopher Robert LeFevre, psychologist Thomas Szasz, Reason magazine founder Robert Poole, space industrialist Gary C. Hudson, feminist Wendy McElroy, agorist Samuel Edward Konkin III, historian Richard J. Maybury, anarcho-capitalist and economist David Friedman, and many more, all selected and edited by L.K. Samuels. A great source explaining the different meanings of individual liberty and classical liberalism. For this second edition, 12 new articles were added by several new authors including historian Jeffrey Rogers Hummel, economist David R. Henderson, blogger Martin Masse and TV commentator Mark Selzer. Copyright © 2005 Exapipe Inc. All rights reserved.